Tunnels and more tunnels everywhere you turn in your yard. Do you have any idea as to the cause of this destruction? If you guessed a mole you may only be half right. Quite often a little animal called a vole follows along behind the secretive and elusive mole. Moles and voles are not at all alike except in a few of their habits. The steps that need to be taken to remove these two animals from the area are totally different and so proper identification is critical to attain control of the situation before it’s to late. We have two programs that guarantee our mole removal. 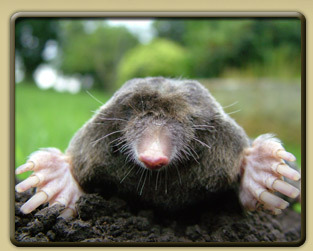 Moles/Voles \’mol\ Members of the family (Talpidae) of mammals that live underground, burrowing holes. \’vols\ Small rodents that live in field and shrub habitats. For moles, breeding takes place around February to June and the young are fully mature at 5 weeks. The female has 1 litter a year (of between 2 to 7 but usually 3 to 4) with the gestation period lasting approximately 42 days. Moles live on average between 2 to 5 years. Voles may breed at any time of year, but their peak breeding period is in the spring. Female voles mature in 35 to 40 days and can have 5-10 litters per year. Gestation lasts for 3 weeks so under favorable conditions their population can increase rapidly.